Creating an online course is not an easy task. And when it comes to the value involved in an online course, your time is the most valuable asset of all. It doesn’t require a fancy, new computer or $10,000 in equipment to produce a course. So why not leverage that investment and utilize the content you’ve created in new ways to drive your business or course further? 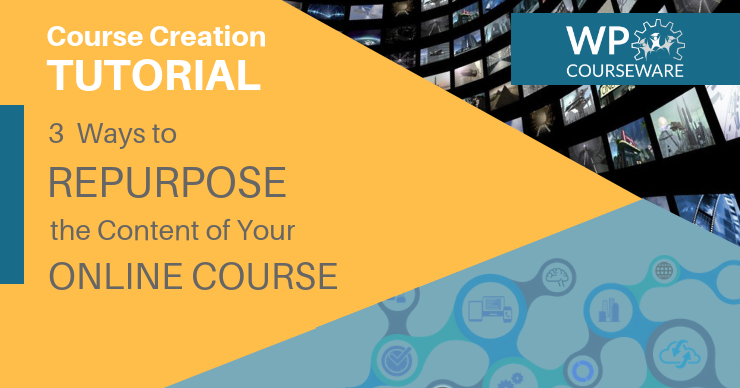 There are a few ways that you can repurpose your course content and in this post, to continue our online course creation tutorial series of articles, I want to discuss three of the main ways you can do so. The first, and most effective method of repurposing course content is breaking out a small section of it and using it as lead magnet. If you’re not familiar with what a lead magnet is, well, you already know what they are. This is a strategy which involves offering something for free in exchange for an email address to build an email list, which you can sell products or courses to over time. You’ve very likely visited an online retailer’s website and been offered a coupon code in exchange for signing up for their email list…am I correct? Discussing how to set up a lead magnet “optin” form is beyond the scope of this post, however, plugins like OptinMonster make the process simple to integrate your WordPress website with email list management services such as Aweber, MailChimp, or ConvertKit. Voila! You’re building an email list! Once you’ve gotten into the email list building, you can begin delivering valuable free content to your subscribers. Don’t just start pitching hard on buying your premium courses in your emails right out of the gate. Build trust first…and the sales will follow. A little over a year ago, I started using an automated online video transcription service called Temi. If you have video content within your course, you can simply upload that video to Temi, pay $0.10 per minute of video, and within just a few minutes you’ll have that video available for download as text. Well, Temi requires a bit of editing as it doesn’t deliver 100% accurate transcriptions (although it’s gotten really close) that means you have not only a course lesson video, but now you can do five minutes of editing to produce a nice, juicy blog post for your site which can be picked up by Google and indexed with all of those keywords you mentioned in your video. Since your video was, well, video (duh!) and your blog post is text, this isn’t treated as duplicate content by the Big G, which they penalize websites for and punish them by de-indexing pages from their users' search result listings. Yes, believe it or not, some websites do just re-post online content like blog posts word-for-word, but Google is not a fan of this practice and will prevent websites from showing in search results just for it. 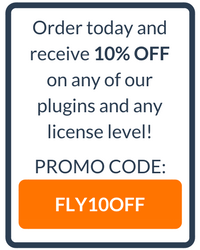 When we first started Fly Plugins and launched WP Courseware, our primary marketing tactic was guest posting on other websites. If you’ve not heard of guest posting, it’s basically a strategy to get your company or website name on an authority site in your niche when you don’t have your own following. When we started Fly Plugins, for example, no one knew who we were or what WP Courseware was. So we began reaching out to large sites such as as WP Beginner, WP Mayor, and Pagely and offering to provide free blog posts. All you really need to do is to reach out to the authority websites in your niche. Let them know that you have an article you’d like to present on their blog, let them know that you’d like a link back to your site in exchange, and let them know about the topic you’re proposing. I love to write, but most website owners loathe keeping up a blog. This tactic works because you’re taking that chore off of their list…at least for the time being.